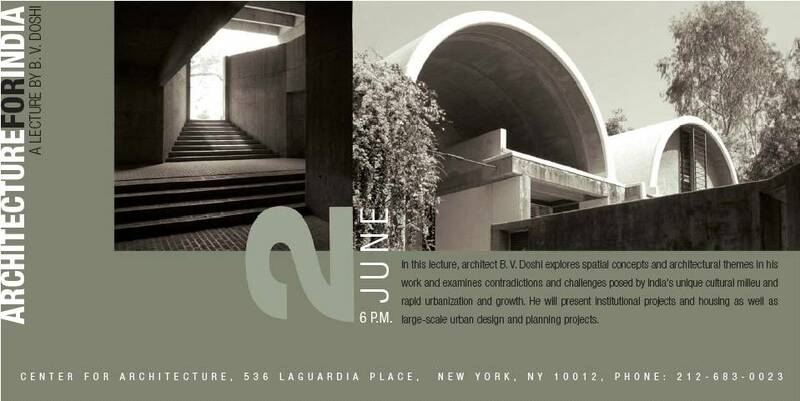 Please come to Prof. B.V. Doshi’s lecture on “Architecture for India” at a time when India is on everybody’s mind. He will explore spatial concepts and architectural themes in his work and examine contradictions and challenges posed by India’s unique cultural milieu and rapid urbanization and growth. The subjects will include institutional projects and housing as well as large-scale urban design and planning projects. Balkrishna Doshi, an Indian architect, educator and planner worked with Le Corbusier in Paris from 1951 to 1954 as senior designer, and then in India to supervise Corbusier’s projects in Ahmedabad and Chandigarh. In 1955 he also established the Vastu-Shilpa Foundation for Studies and Research in Environmental Design, known for pioneering work in low-cost housing and city planning. He maintains an office, Vastu-Shilpa Consultants, in Ahmedabad. Prof. Doshi has been visiting the U.S.A. and Europe since 1958, and has held important chairs in American universities. He has received numerous international awards and honors, including Padma Shri from the Government of India and an honorary doctorate from the University of Pennsylvania. In 1995, he received the Aga Khan Award for Architecture for the Aranya Community Housing in Indore, India.